Back in March, some of you may recall my home was broken into while I was at a rehearsal dinner for T’s mother’s wedding. I came home and didn’t notice anything for probably a good half hour — until I went into my bedroom and saw big, muddy boot tracks all over the floor, along with the contents of my wardrobe and the covers from my bed. Perhaps it was one too many childhood viewings of THE BODYGUARD, but that freaked me the heck out. At that point I had no idea that anything had been stolen, nor that my house had been forcibly entered. It just looked like someone had rummaged around in my bedroom for who knows what reasons. I couldn’t fathom any purpose or any person who would do such a thing. I called T and asked if he could come over (which of course he did). I also called my parents and worried the heck out of them, though they called off the brigade once they knew T was on his way over. While I was waiting for him, I started looking around (a no-no if you’re looking for lessons here, though I think I was at least carrying around my bat at this point) and noticed the front door looked slightly ajar. Sure enough, it had been pried open with some sort of crowbar-like contraption. A busted door makes for one sad Ditty. Up until then, I was still half-convinced I was just hallucinating. But the door brought everything back down to earth, and I called the police. While on the phone with them, I discovered that my beloved MacBook Pro, which had been in its laptop bag by the door (also not exactly a smart move) had disappeared. I looked through the rest of the house, and amazingly, nothing else was taken. Neither of the flat-screen TVs, amazingly not my iMac, nor anything else of worth. Just my laptop, my laptop bag, and everything contained therein. Luckily, I operated solely in Dropbox AND had Carbonite installed on my old laptop, so I lost no data, and none of my accounts were ever hacked, thank goodness. So, in light of silver linings, right now I would like to take the opportunity to say this. I hope you are enjoying my six-year-old laptop with zero battery life (which was probably not even compatible for OSX Lion). I know it’s still a fine computer as long as you don’t mind keeping it plugged in at all times and never accidentally yank out the magnetic power cord because then you only have about three seconds before it dies. I can’t tell you how happy I am that it found a new (if surprising) home. Do treat it well, as it treated me well for many years. A lot of stories were crafted with those keys. I also want to thank you for forcing me to get a new laptop, which I’d been planning to do anyway toward the end of the year or the beginning of next. I’d been saving toward one but still had a ways to go, but your plan saved me the hassle and allowed me to fork over nothing more than a $500 deductible instead of the $1800 I’d been planning. 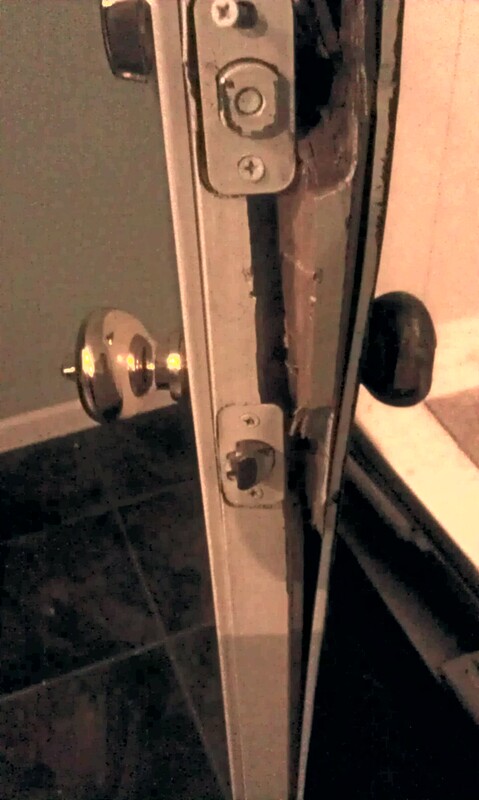 Additionally, as I’m sure you noticed when you broke into my house, my front door has long had a nasty habit of sticking like crazy, to the point that I had to kick it to open it most of the time. Thanks to you, I will soon have a lovely new door that opens and shuts properly, and without that nasty draft it let in underneath. The cost for that was nearly $1700, but it was paid by my insurance company rather than me. I also received some cash for some other items, so in the end I think I came out way ahead compared to you. So I guess I owe you a debt of gratitude. But you have my laptop, and my favorite laptop bag which they no longer make, plus some story notes and a notebook with who knows what in it, and probably a few G2 pens. Plus I had to clean up your mess, and spend my time on the phone with the insurance company (I’m guessing I bill at a higher rate for my time than you do), not to mention dealing with the hassle of getting a new door installed. So that probably makes up for any debt I owed you after all. I think we can call it even. Learn to wipe your damn feet, jerkface. Yes, a big relief that you had Dropbox and Carbonite. That would be equally, if not surpassingly damaging as a loss to me. Smiled at your dig at the end of the letter.